My last column discussed the preliminary results of NGS’ second Multi-Year CORS Beta Solution of the National CORS. 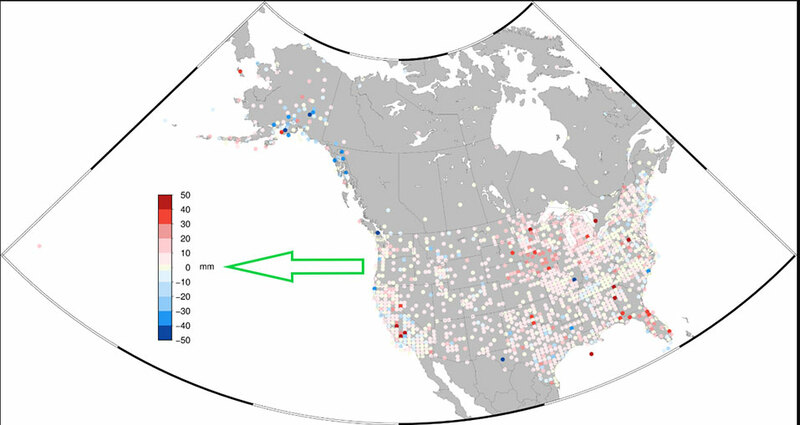 Since my last column, NGS announced the release of the beta version of the hybrid geoid model GEOID18 and, on Feb. 15, NGS officially released the Beta CORS ITRF2014 coordinates and velocities. 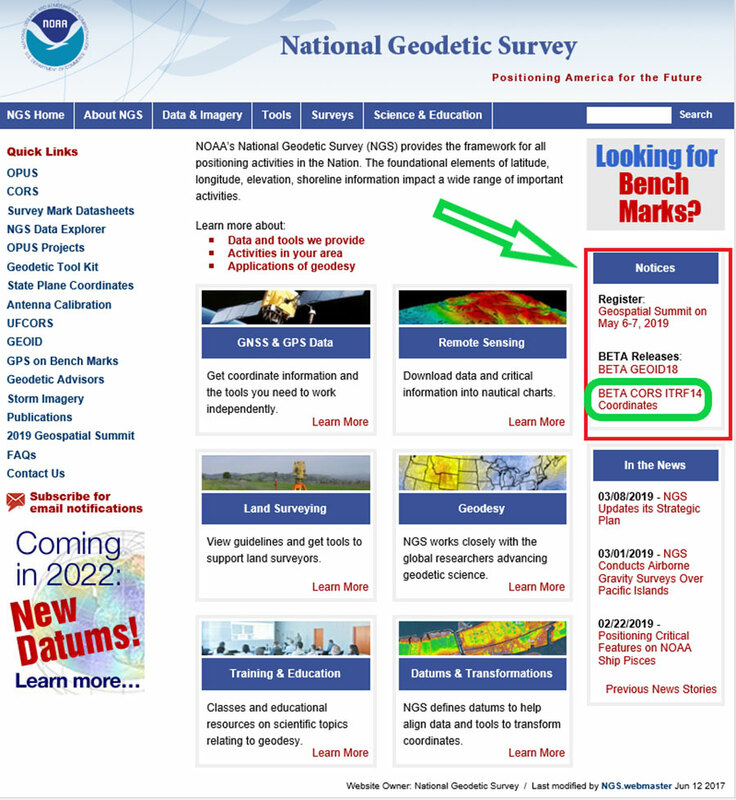 This column provides the official links to NGS website that provide the beta coordinates and information about the latest multi-year CORS solution. 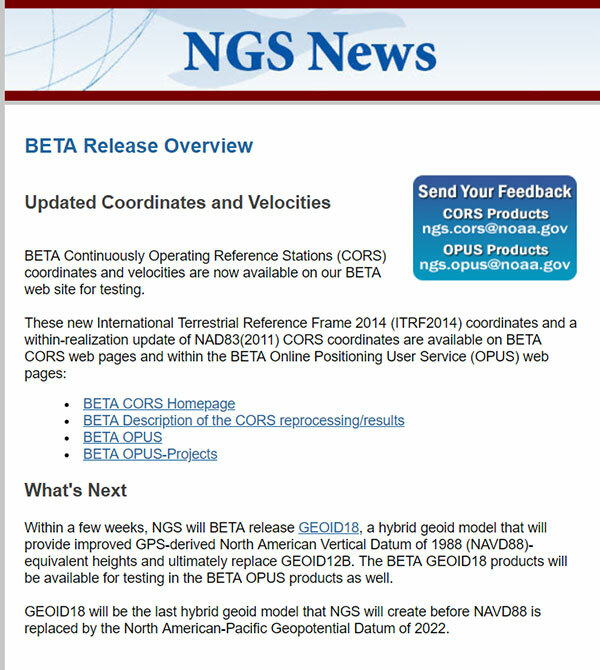 Below is the NGS announcement of the beta release of the updated coordinates. 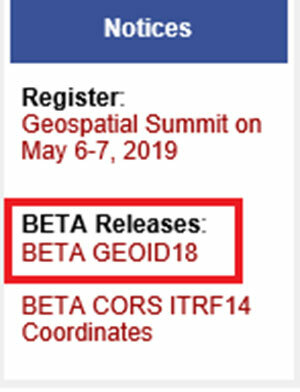 NGS also provides a notice of the new beta coordinates on the National Geodetic Survey homepage, with a link to the Beta CORS ITRF14 coordinates (see the highlighted section below). Clicking on the hyperlink labeled BETA CORS ITRF14 Coordinates directs you to the Multi-Years CORS Solution informational homepage. By clicking on the CORS Home button, the user is directed to the Beta CORS page. This page clearly states that the ITRF2014 reference frame for CORS is available as a beta product. It also implies that these coordinates are being used in other beta products such as OPUS. I’ll address this later in this column. Users can obtain information about the MYCS and other related products and services such as Beta OPUS by clicking on links provided on the Beta CORS homepage. It should be noted that these values are considered “beta” and are available to users for testing and feedback. NGS provides a statement about its beta release products. Basically, it states that users should only use beta products to test their workflows and never for official or production work. To facilitate testing of the beta CORS coordinates and velocities, NGS provides links to other beta products that will use the MYCS 2 coordinates and velocities. 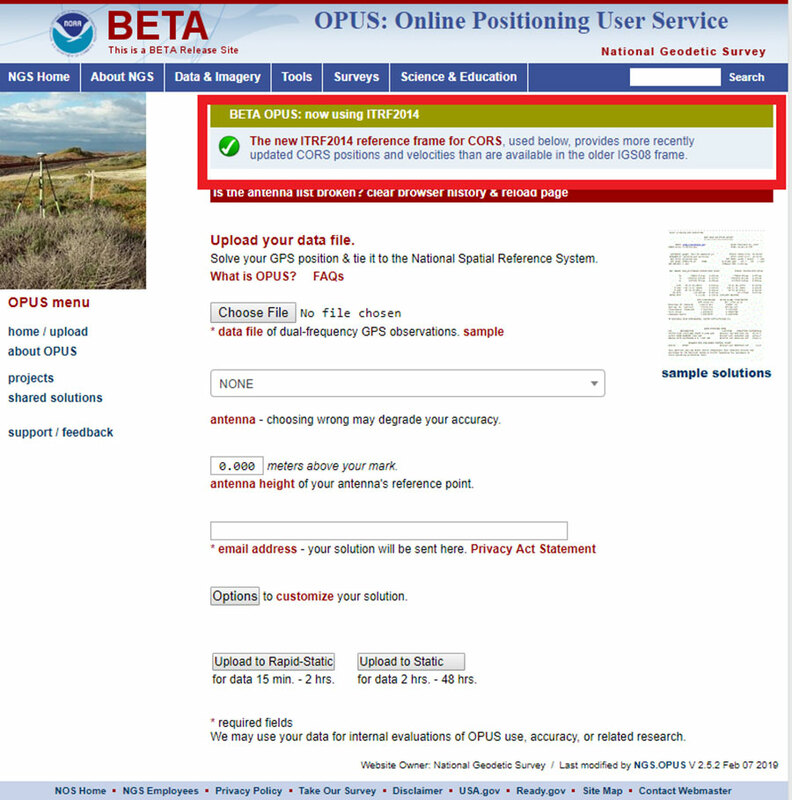 By clicking on the link labeled BETA OPUS on the beta CORS homepage, the user is directed to the BETA OPUS webpage. This page clearly states that the beta OPUS routine uses the new ITRF2014 reference frame for CORS. 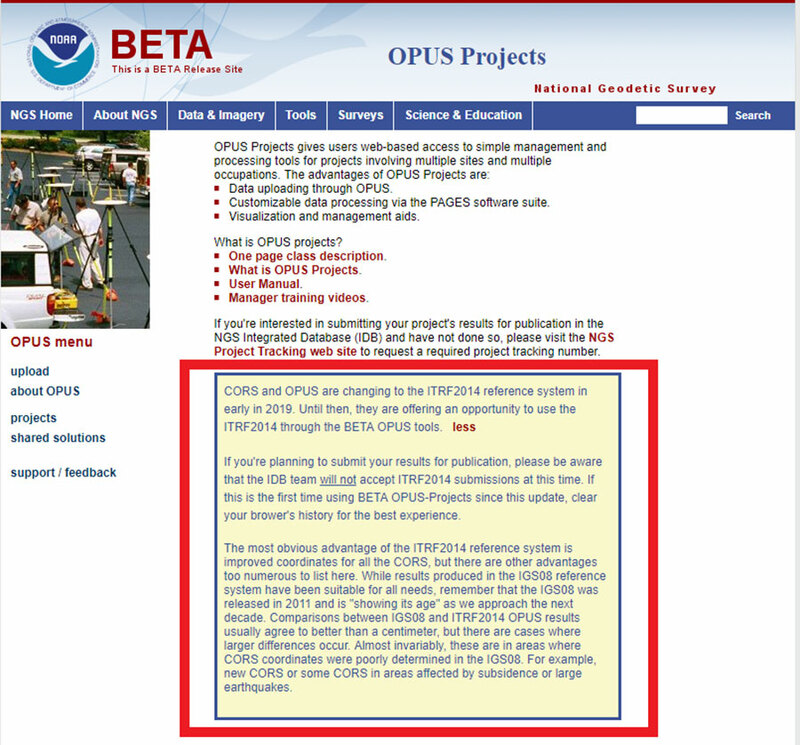 NGS also provides a link to Beta OPUS Projects that use the MCYS2 coordinates and velocities. 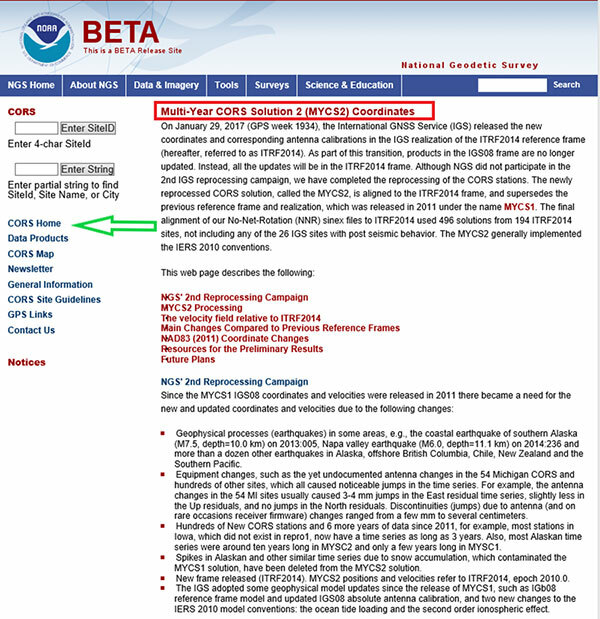 Once again, the Beta OPUS Projects website clearly states that the beta version is using the CORS coordinates and velocities from the MYCS2. It also states that, at this time, NGS will not accept ITRF2014 submissions for publication. As previously stated, NGS’ beta products are for users to test their workflows and should never be used for official or production work. 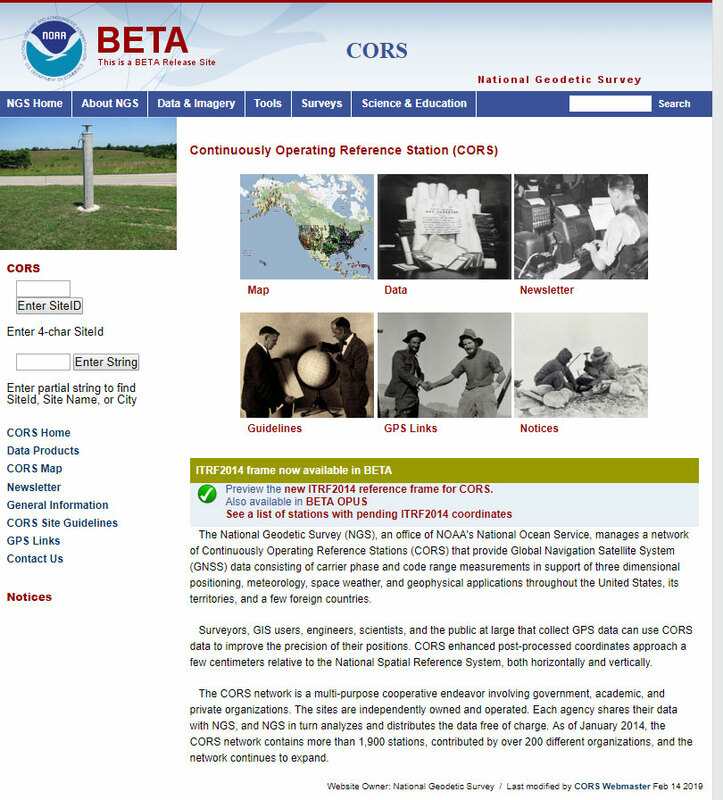 The Beta CORS webpage provides a lot of valuable information on the processing and establishment of the multi-years CORS solution. I’ve highlighted several of the sections below. First, by clicking on the link MYCS2 Processing, the user is directed to the section that describes the data used and the processing strategy. The processing included data spanning 1996 to 2016 and involved around 3050 CORS, IGS and other (e.g., NGA) stations. The corresponding input and output data occupied about 25 TB on the NGS computers. The residual time series in the early 1990s showed exceptionally noisy behavior at times, which were deleted in the alignment/velocity computation stage. 1. The global processing step solves for orbits, Earth Orientation Parameters (EOPs), hourly tropospheric delay parameters and weekly global (IGS) station positions in an IGS-NNR frame. 2. 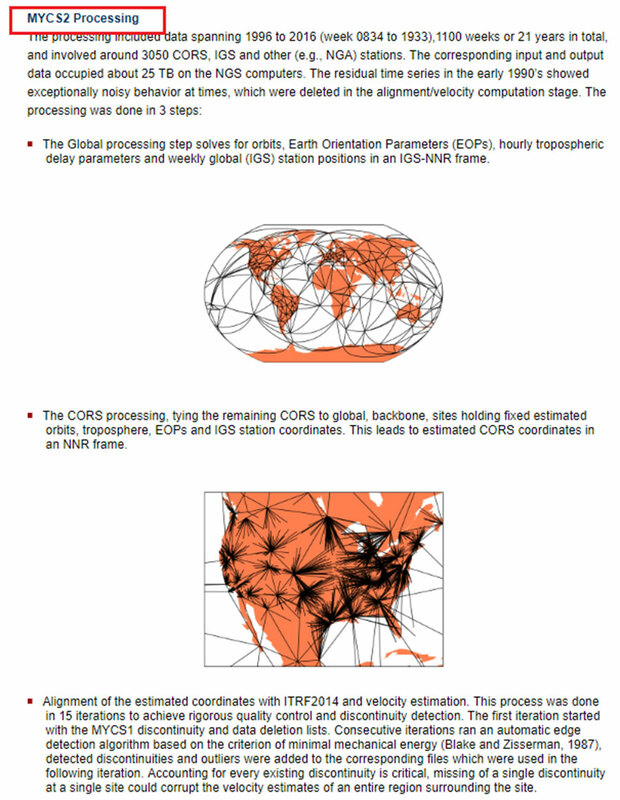 The CORS processing step ties the remaining CORS to global, backbone, sites holding fixed estimated orbits, troposphere, EOPs and IGS station coordinates. This leads to estimated CORS coordinates in a no net rotation (NNR) frame. 3. The last step is the alignment of the estimated coordinates with ITRF2014 and velocity estimation. This process was done in 15 iterations to achieve rigorous quality control and discontinuity detection. Linear velocities for all stations are estimated in the NGS realization of ITRF2014. NGS explains how this was implemented in the section titled “The velocity field relative to ITRF2014” (see box titled “Section Describing the Velocity Field Relative to ITRF2014”). The website provides figures that depict the horizontal and vertical velocities used in the processing. Unless an earthquake or a post seismic adjustment occurred, the velocities of a station in between discontinuities are constrained to have the same value. Stations that experience earthquakes, post seismic adjustment and in a few cases, non-uniform vertical motion, are allowed to have different velocities in between events as dictated by the data. 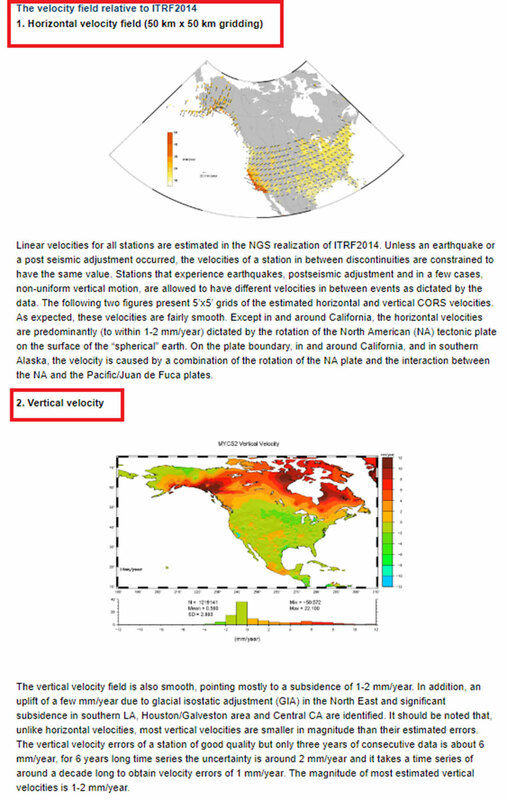 The webpage provides figures that depict the estimated horizontal and vertical CORS velocities. What users usually want to know is how much the coordinates have changed and what it means to their surveying activities. The section titled “Main Changes Compared to Previous Reference Frames” provides information and plots that depict the changes of coordinates. This section provides NAD83 (MYCS2) coordinate values minus NAD83 (MYCS1) coordinate values. The ITRF2014 coordinates of all computed CORS coordinates from MYCS2 processing are converted to NAD83 (2011) using HTDP. The resulting NAD83 (2011) coordinates are then compared to those obtained from MYCS1 at all common sites. 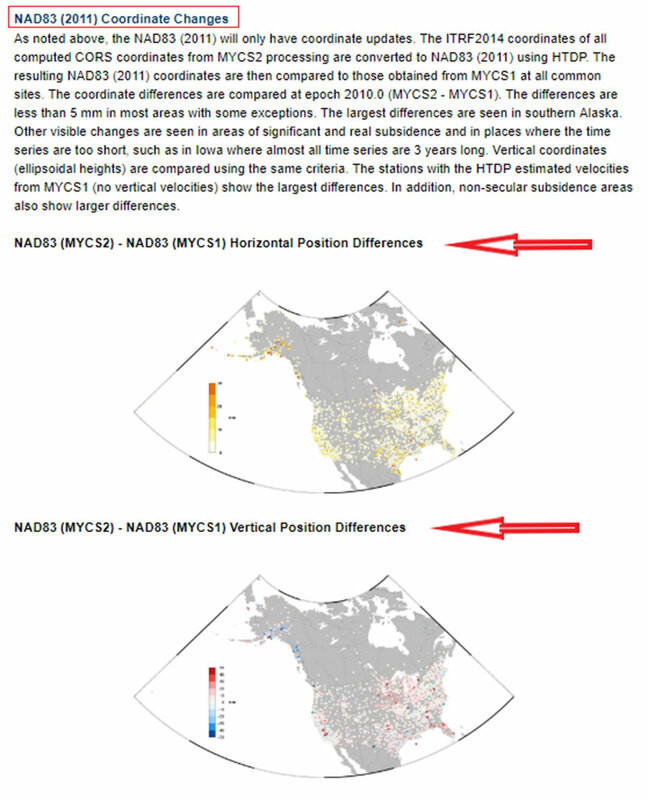 The coordinate differences are compared at epoch 2010.0 (MYCS2 – MYCS1). The differences are less than 5 mm in most areas with some exceptions. 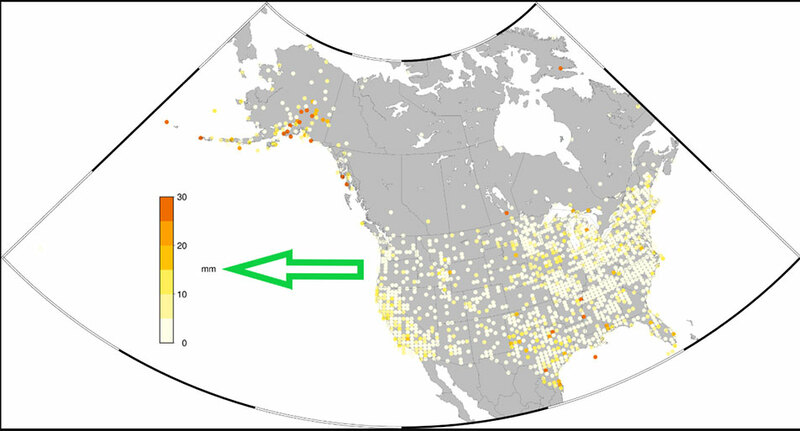 The largest differences are seen in southern Alaska. Other visible changes are seen in areas of significant and real subsidence and in places where the time series are too short, such as in Iowa where almost all time series are three years long. Vertical coordinates (ellipsoidal heights) are compared using the same criteria. The stations with the HTDP estimated velocities from MYCS1 (no vertical velocities) show the largest differences. In addition, non-secular subsidence areas also show larger differences. NGS has done a tremendous job of explaining the MYCS2 process and results. As the results indicate, most differences between the MYCS1 and MYCS2 are small. Saying that, I would encourage all users to look at the NGS Beta webpages and obtain an understanding of the MYCS2 process and results. Users should also use the beta products and compare their results to the current production products to evaluate the CORS beta coordinates and velocities in their region of interest. It should also be noted that in late February, NGS released a beta version of the latest hybrid geoid model, Geoid18. 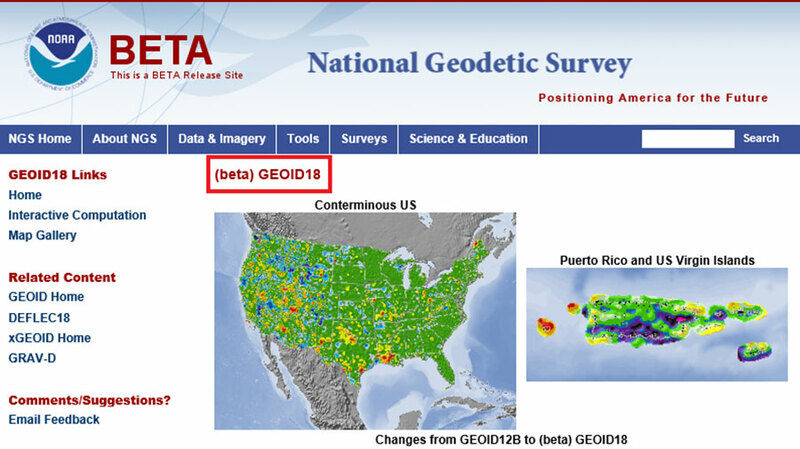 This model can be accessed here; the site provides an opportunity for users to compute a beta Geoid18 value for a particular station. I would encourage all users to obtain an understanding of the new hybrid model. Once again, it should be noted that this model is a beta model for users to test their workflows and should never be used for official or production work. My next column will discuss the beta hybrid Geoid18 model, and the differences between the beta model and the official hybrid geoid model, Geoid12B.